Iran’s supreme leader endorsed President Mahmoud Ahmadinejad for a second term in office on Monday, state-run Press TV reported. Under Iran’s constitution, the incoming president must receive the supreme leader’s approval before being sworn into office. Ayatollah Ali Khamenei’s endorsement is the first step in that process. 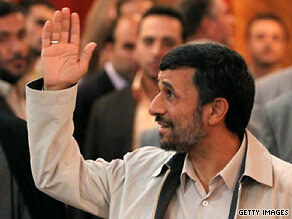 Ahmadinejad will be sworn in as president Wednesday in a ceremony to be held in parliament. The incumbent was declared the winner of the June 12 election with almost two-thirds of the vote. Iranian opposition leader Mir Hossein Moussavi called the results a “fraud.” The results, surprising to many Iranians and political analysts, prompted sometimes violent demonstrations across the country as thousands of Iranians took to the streets to protest. Hundreds were detained, among them 50 “political figures” accused of playing key roles in the street demonstrations. Nearly 100 Iranians arrested in the aftermath of the disputed elections went on trial Saturday, two Iranian news agencies reported. An additional 10 people went on trial Sunday, according to government-funded Press TV.